Do you ever find yourself at a loss when someone asks, “What are you grateful for?” Being grateful for a good many things isn’t difficult, but then the moment arrives when you’re put on the spot. How grateful I am that my family does NOT follow that tradition! I also appreciate learning something new about gratitude each year. For example, some earlier and fascinating research you can read about here suggests that when it comes to gratitude journaling, we don’t need to force ourselves and our children to practice this habit every day. What a pleasant surprise. Honoring the less is more approach yields BETTER results! This year I learned that the best gratitude practices may, in fact, be all about the details. According to gratitude researcher Robert Emmons, naming a list of five items that we are grateful for may actually be LESS beneficial than expanding on the details of just one. To help simplify even further, today I bring you a free complement to my Printable Gratitude Journal for Kids. 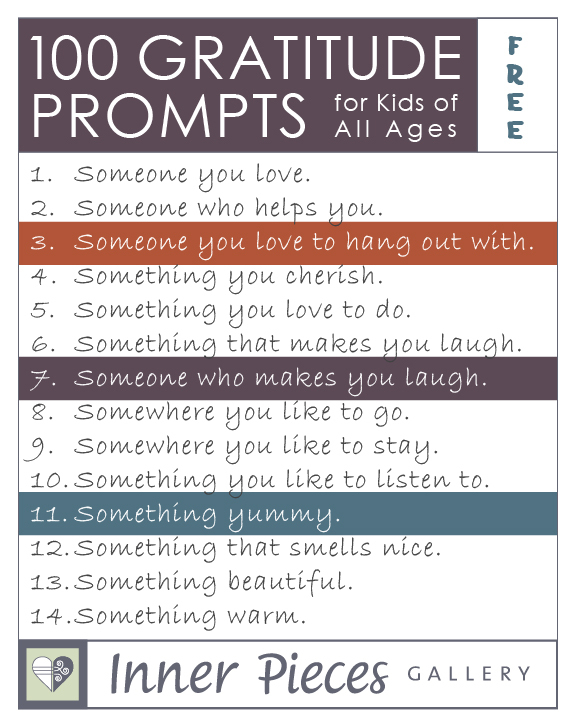 It’s a printable list of 100 Gratitude Prompts to use however you would like. Bring it to your Thanksgiving meal and pass it around. No more uncomfortable pressure trying to think of something on the spot. Or… have your child choose a number between 1 and 100 (or pull a number from a hat), then write any details about that particular item on the list. The little ones can choose a number between 1 and 10, twice. They may draw or collage on the pages of their gratitude journal instead or writing, then simply describe the details to you. Or… use it to stimulate ideas for your own gratitude journal. Or… use it for any gratitude craft you are working on. Or… classroom teachers, give every student in class a different prompt to journal about (they can choose numbers out of a hat, too), then allow everyone to share. You can also use all of those student contributions to create an entire classroom project. A Garden of Gratitude, for example, or a construction paper chain. Ready to download the complete list, 100 Gratitude Prompts? Subscribers, sign in. New to Inner Pieces Gallery? Sign up for the newsletter below! Once you complete the simple registration process you will gain access to the entire Free Printables Collection. There you’ll find the Printable Gratitude Journal for Kids I mentioned above PLUS even more printable gratitude activities, like the ones you’ll find in my Gratitude Printables Roundup.